Ayrshire shares with Dumfries and Galloway some rugged hills country known as the Galloway Hills. These hill lie to the west of the A713 (Ayr to Castle Douglas road) and they run south from the Loch Doon area almost to the Solway Firth. To the east of this route through the hills lie the Carsphairn and Scaur Hills which lie to the south east of Dalmellington and south of New Cumnock. Glen Afton runs deep into these hills. Glasgow Prestwick International Airport, serving Glasgow and the West of Scotland more generally, is located more than 30 miles away from Glasgow in Ayrshire. The name Glasgow was added on in front of Prestwick as per American military airport naming conventions, as the airport was in the past oft-used as a stopover by US military personnel on their way to and from military bases in Germany. Moreover it has a niche in rock history as the only place in Britain visited by Elvis Presley, on his way home from Army service in Germany in 1960. 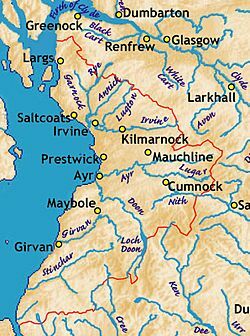 The area that today forms Ayrshire was part of the area south of the Antonine Wall which was briefly occupied by the Romans during the reign of Emperor Antoninus Pius (see: Roman Britain#Occupation and retreat from southern Scotland). It was inhabited by the Damnonii, who are presumed to have been Britons. Later, it formed part of the British Kingdom of Strathclyde, which was incorporated into the Kingdom of Scotland during the 11th century. In 1263, the Scots successfully drove off of the Norwegian leidang-army in a skirmish known as the Battle of Largs. 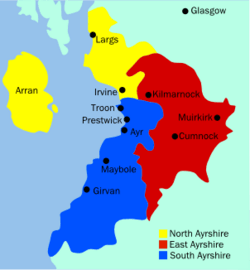 During the early 17th century, many people from Ayrshire moved to Ireland as a part of the Ulster plantation with surnames such as Burns, Hamilton, Morrow, Stewart and Kennedy. Ayrshire Facts for Kids. Kiddle Encyclopedia.